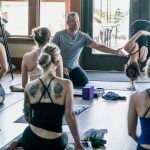 It’s no surprise that inversions tend to create fear during our yoga practice—our world is literally being turned upside down! During this class we will uncover the foundational information necessary to create inversion and arm balancing confidence. We will also reveal the nuances to certain poses that will help you maintain balance and integrity throughout your gravity surfing exploration. o Breathing exercises, such as Uddiyana Bandha. o Our core and why our connection to it is crucial to arm balancing. o How to cultivate strength and awareness more intelligently. o Standing poses that create strength and flexibility to support arm balancing. o Crow, Scissors, Handstand, Forearm Balance, and more. Uplift your yoga practice by exploring arm balances and inversions! Begin to experience the exhilaration, sense of power and joy that awakens within when you discover how to work with (instead of against) a fascinating force of nature.